When I hear the name InWin, I think of sturdy, beige boxes. 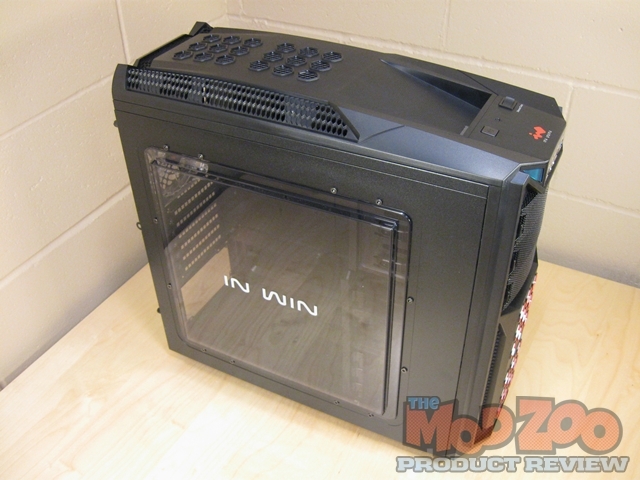 When you needed a rock solid case to build (or mod), InWin was there. Their cases were known for durability, thicker steel, and the lack of sharp edges. And the looks…..plain vanilla at best (with a few exceptions). Until now! They’ve started a serious line-up of cases aimed at the enthusiast market. They’re taking chances in a big way, futuristic designs with the features you want; even some, out of this world, “frame only” cases. Now that’s thinking out of the (beige) box! The GT1 is such a case. A stylish Mid Tower Case, inspired by the lines of a sporty car. The InWin GT1 arrived in a graphics intensive box, with a sporty car image on it. The multi-lingual manual continues on with the sporty car theme. The hardware bag is a thick, zippered bag that even includes re-useable wire ties! Great review, Thank you Greg! ….I think this case would have been good candidate too, for our staff case mod. Inwin, please contact me about collaborating on a future case design for you. Thanks for the review Greg. It looks like a pretty sweet case, and especially for the price. Great review Greg, I will say the case has a unique design, not something you see every day. I agree with Bill, this case would have been great for our staff mod as well. hmmm, we need to finish that case!!!! !